Some funeral directors find it easy to charge grieving families higher prices, the UK's competition watchdog has said ahead of an in-depth investigation. The Competition and Markets Authority (CMA) has announced it will conduct a full inquiry into the funerals sector. 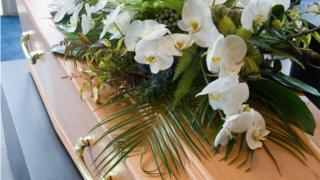 The essential costs of a funeral have increased by 6% each year for the past 14 years, it said. Families struggled to find clear prices and details of services online, and were unable to shop around. As it was such a difficult time, it was hard for grieving relatives to search out a range of options, the CMA said. "This appears to have made it easier for some funeral directors to charge high prices," it said. In November, the CMA said it had "serious concerns" about above-inflation price rises. The CMA found that people typically spent between £3,000 and £5,000 organising a funeral, with the average price of the core elements now standing at £4,271. Larger chains had consistently raised prices, it said. Now, it has concluded that a full investigation is needed. Cremations account for a large share of the cost and the CMA said that the largest private crematoria operators had increased prices by between 6% and 8% each year for the past eight years. Some local authorities had also raised fees considerably. The watchdog also highlighted the sparsity of crematoria providers in local areas, and said it was difficult for new companies to enter the market owing to the planning regime and high fixed costs. Shares in Dignity, one of the UK's largest funeral providers, fell by nearly 3% in early trading, having also dropped sharply after the CMA's interim announcement in November. Mike McCollum, chief executive of Dignity, said: "Dignity has made clear that we welcome the CMA's investigation into the funeral market and look forward to continuing our work with the CMA and other industry bodies to protect consumers." Terry Tennens, chief executive of the National Society of Allied and Independent Funeral Directors, said "it's important that a distinction is made between the behaviour of family run firms and large chains and crematoria operators. "We're working with partners across the funeral sector to agree a website price template which will provide the public with a format that enables easy comparison of funeral director prices. In the meantime, we urge all our members with websites to display their prices online."